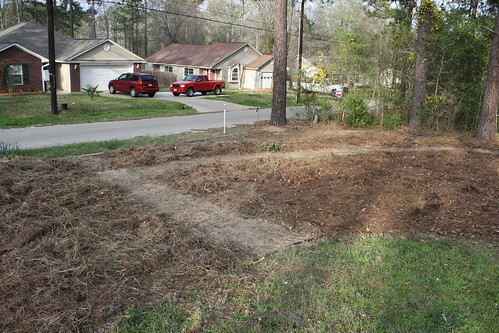 This weekend really kicked off the 2011 spring gardening season. I have planted a little bit of seed already, but this is the first full weekend dedicated to yardwork of the year. I had a few goals. First and foremost, I needed to get the front yard planted. This is what I had to work with. Not a lot, really. A pretty bare slate. 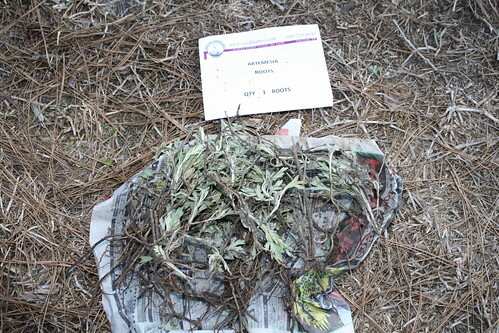 I had placed an order for rootstock of big bluestem, indiangrass, artemesia, and gayfeather and they had arrived Thursday evening. They NEEDED to get in the ground ASAP, so that was #1. First, I had to edge the area, so I spent some time installing the necessary edging. After edging, I had to get rid of everything growing in the bed so I was starting from as fresh a palette as possible. At this point, I was ready to plant. 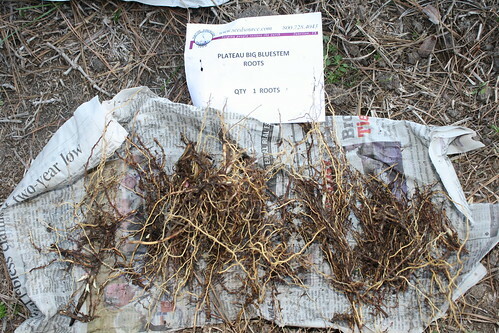 I spent the next few hours planting rootstock from the aftorementioned plants. They may not look like much, but these plants should all get to be at least 5ft tall. The big bluestem has the potential to get 12ft seedheads on it. My inspiration for this area can be summed up by the back of the Native American Seeds catalog. I'm going to have more bunchgrasses in mine, but I'll have some variety in mine, too. 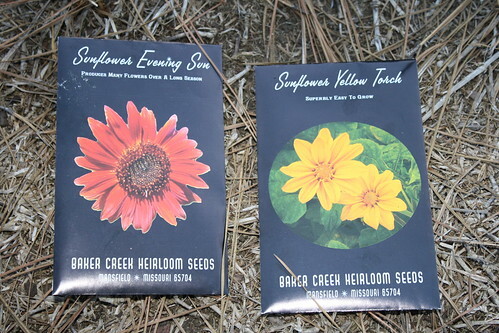 I've got a few flower seeds to plant in the area, also. While I was busy with all this on Saturday, my wife was working in the back of the house. We're working on finishing a bed along the back side of the house this year, and my wife was working on a portion of it. Roses seem to do well here with little attention, so she decided to plant some more. The small shrub towards the back is an ornamental pomegranate that seems to like the location, also. This area is going to get edged with landscape timbers and leveled some with topsoil in coming weeks. A drip irrigation system will also be installed here. Behind my wife (taking the photo) is a large ceramic pot (about 2' in diameter) that will become a water garden once the area is leveled. A cardinal was already drinking from the scant amount of accumulated rainwater today at lunch. More pictures and descriptions of this as it nears completion. The weeds will vanish in coming weeks, also. My wife was also working on planting vines on our pergola that we built last year over the patio we built a few years ago. 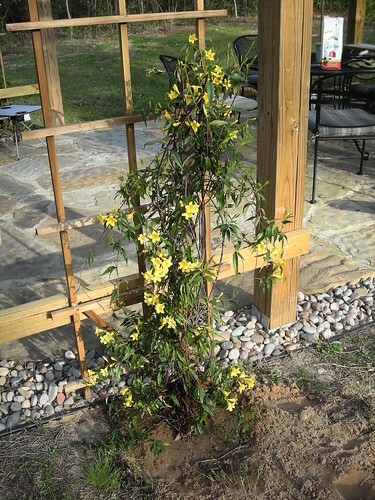 We chose to plant two carolina jessamine vines and two crossvines on the pergola. The jessamines have been blooming for a bit already, and the crossvines are just starting. That should give us nice spring color. The jessamines are evergreen, and the crossvines are semi-evergreen, so they should provide good year-round shade, hopefully with better coverage in the summertime when it's really hot. Sunday was mostly finish work for me. I spent most of the day putting mulch down over the rootstocks I planted the day before. They need protection from the sun and they need that extra moisture retention the organic matter will provide. I harvested pine straw from the woods in the backyard for this. It's a little too "dirty" to put next to the house (full of sticks, pine cones, and shreds of various other plants from raking it up), but it's perfect for this landscape. Also, it probably saved me a couple hundred bucks from purchasing mulch of some sort. I marked off some paths through the area so we can walk through and view it. I will cover the paths with wood mulch - I have a big woodpile in back I've been needing to mulch and this will be the perfect spot for all of that. 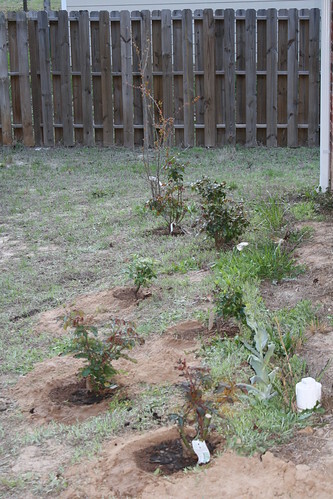 I also planted some trees. 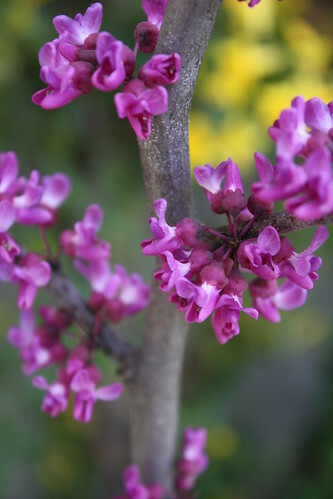 In the front I planted two Texas redbuds, which are in bloom right now. I also planted a fan-tex ash in the back. I made a tree mistake last year and planted a bur oak in the backyard to shade a particularly hot part of the yard. The yard was just too dry and hot for that bur oak. It didn't completely die last year, but enough of it did die that it would look terrible as it came back this year. I decided to cut my losses and replace it with something more suited for the location. 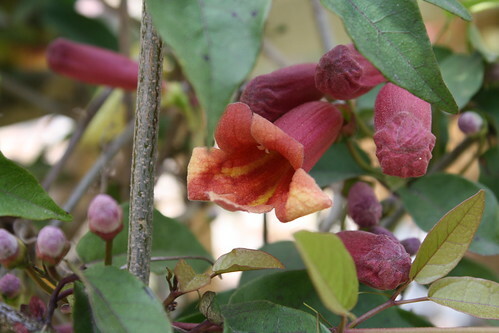 The ash is labeled as a tree that likes hot and sunny areas, is very drought tolerant, and will do well in very poor soils. Perfect! That's exactly the type of situation we have to work with. I didn't take any pictures of it, but it's a good 10ft tall already, which means it was quite rootbound. 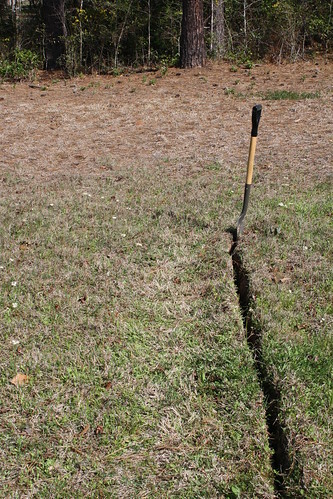 It'll take some TLC to help it put down a solid root system. I'll be running the drip irrigation system to this tree, so it should help. 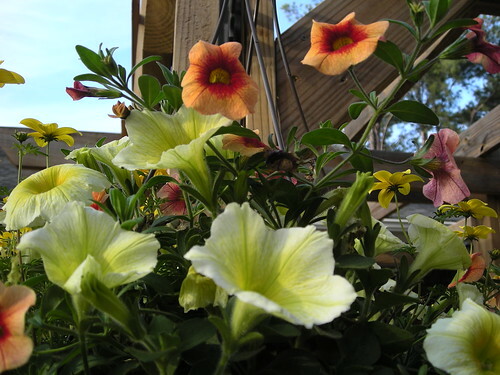 We also got some nice hanging baskets to spruce up the pergola. My wife also worked on the front beds where we've had problems with azaleas. One of the Encore azaleas we planted a couple springs ago is still alive to our amazement, but all the others kicked the bucket awhile ago. She moved the hostas around to shadier spots since they don't leaf out for very long in the sunnier spots. 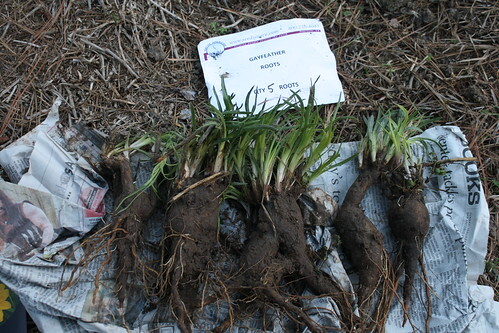 They still had nice root systems, though, especially the patriot hostas. The rest of the garden she seeded with a few varieties of annuals. Some poppies, bachelor's buttons, and some other hardy flowers. 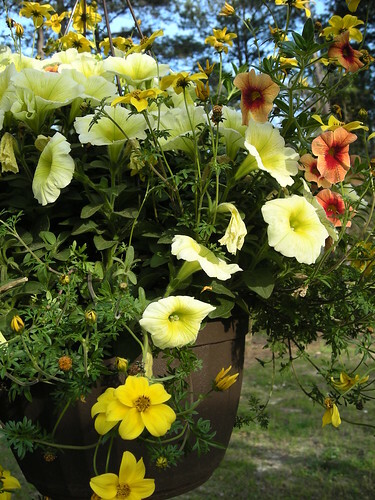 We have had no trouble with annuals in these beds, so why mess with something that works? We just change them up every year for something new. 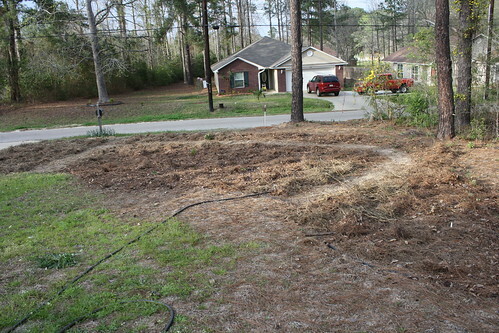 I'm very excited for the front bed that replaces a bunch of the lawn area. Last year, mowing the entire lawn took almost two tanks of gas in the mower and I'm just fed up with that. 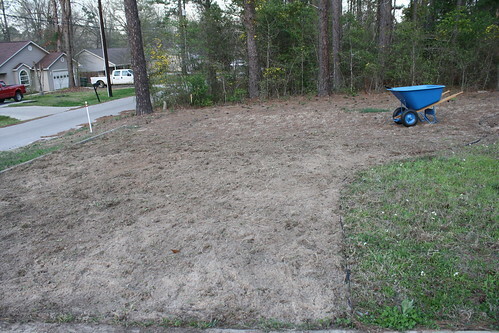 Especially since most of the front yard was just weeds, anyway, and all the sod was dead before we even moved in. Stupid St. Augustine grass. I seeded a bunch of centipede grass in the back earlier in the spring in some areas in dire need of some grass and it's doing well. 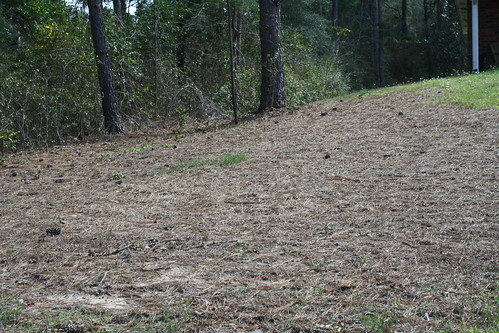 I will seed a much larger area with buffalo grass in the fall. 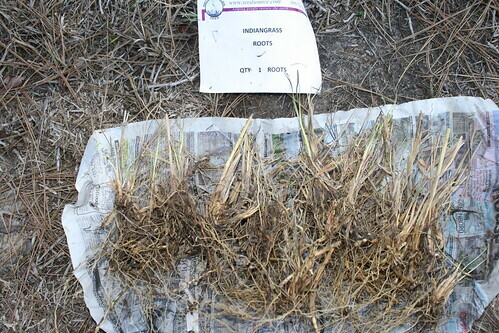 It's a native shortgrass from west Texas and does well on VERY little rain, so it should really spruce up the lawn areas with low maintenance sod. The native grasses will really fill in and provide some height structure. The gayfeather is a good hummingbird plant, so that should be exciting. 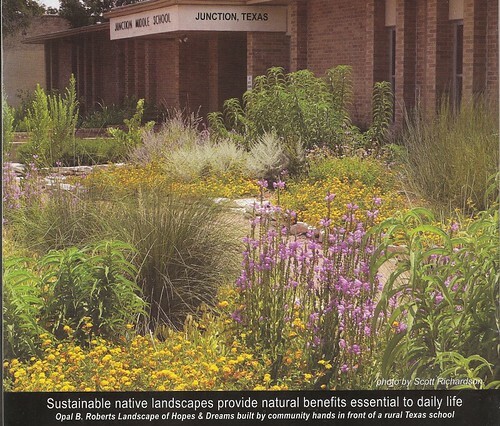 Soon, I'll be able to submit my paperwork for the Best of Texas Backyard Habitat certification. The last thing I'm waiting on is the water feature and it should be done in a week or two.